A soft drink is a beverage that typically contains carbonated water, one or more flavourings and sweeteners such as sugar, HFCS, fruit juices, and/or sugar substitutes such as sucralose, acesulfame-K, aspartame and cyclamate. Soft drinks may also contain caffeine, colorings, preservatives and other ingredients. Almond – common mixed flavor in many drinks, also the primary flavor for brands like Suburban Club colas. 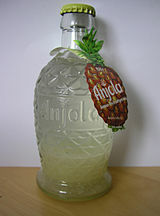 Almond-flavored soft drinks are sometimes prepared using orgeat syrup. 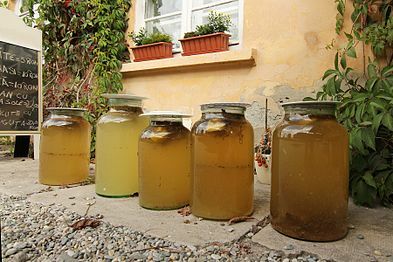 Apple – Fassbrause is a non-alcoholic or alcoholic (depending on the brand) German drink made from fruit and spices and malt extract, traditionally stored in a keg. It often has an apple flavor. Apple Beer is a non-alcoholic American variant of fassbrause, produced by The Apple Beer Corporation in Salt Lake City. Aspen Soda was an apple-flavored soda sold across the United States by PepsiCo from 1978 until 1982. In 1984, PepsiCo came out with a replacement apple soda under its new Slice line. Cherry cola – brands include Coca-Cola Cherry, Pepsi Wild Cherry and Cherry RC, among others. Cherry soda – brands of cherry-flavored soda include 7 Up, Cherikee Red and Crush, among others. 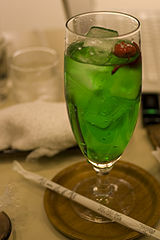 Cherryade – soft drinks prepared with cherry juice. Cola – originally contained caffeine from the kola nut and cocaine from coca leaves, and was flavored with vanilla and other ingredients. Most colas now use other flavoring (and caffeinating) ingredients with a similar taste and no longer contain cocaine. It became popular worldwide after pharmacist John Pemberton invented Coca-Cola in 1886. 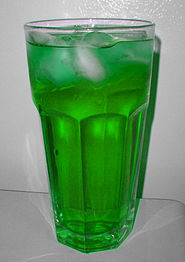 Cucumber soda – type of soda made by various manufacturers including Mr. Q. Cumber. Pepsi offers an ice cucumber flavor in some markets. 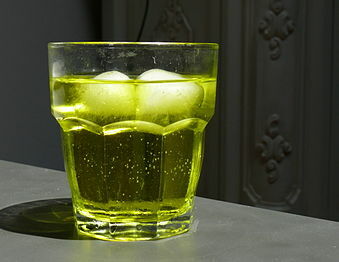 Ginger ale – carbonated soft drink flavored with ginger in one of two ways. The golden style is closer to the ginger beer original, and is credited to the American doctor Thomas Cantrell. The dry style (also called the pale style) is a paler drink with a much milder ginger-flavor to it, and was created by Canadian John McLaughlin. Ginger beer – produced in two versions: brewed ginger beer (which includes home-brewed) or a carbonated drink flavored primarily with ginger and sweetened with sugar or artificial sweeteners. Grapefruit – brands of grapefruit-flavored soda include Fresca, Pelmosoda and Squirt, among others. 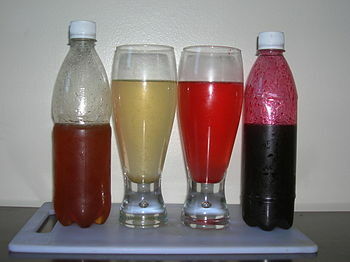 Guarana – carbonated soft drinks with guarana are produced and marketed in Latin American countries. Lemon – liquid derived from the outer skin of lemons may be used to flavor soft drinks, other beverages and foods. Brands of lemon-flavored soda include Coca-Cola with Lemon, Gini and Solo, among others. 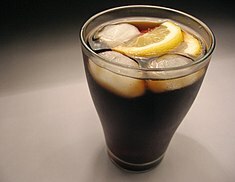 "Lemonade" in the United Kingdom and other Commonwealth countries, or limonada in Mexico, may refer to carbonated lemon-flavored soda as well as the non-carbonated version. Mate – such as Club-Mate, a caffeinated soda made with Yerba Mate extract, based on mate, an infusion of Yerba mate. Melon – Mello Yello produced a melon soda called Mello Yello Melon. It was discontinued. Passionfruit – such as Passiona, sold only in Australia. There was also a brand of Fanta produced in Brazil with the flavor, selected by the customers in a contest. Pineapple – brands of pineapple-flavored soda include Fanta, Sun Crest and The Pop Shoppe, among others. Raspberry – may be referred to as raspberryade in the United Kingdom. Similar soft drinks are also known as raspberry soda in other parts of the world. Root beer – originally made using the root of the sassafras plant (or the bark of a sassafras tree) as the primary flavor. Sarsaparilla – originally made from the Smilax regelii plant. Nowadays, sodas with this flavor are sometimes made with artificial flavors. Spruce beer is a beverage flavored with the buds, needles, or essence of spruce trees. In the Canadian provinces of Newfoundland and Quebec, it is known in French as bière d'épinette. Spruce beer may refer to either an artificially flavored non-alcoholic carbonated soft drink, or to genuine spruce beer. Strawberry – brands of strawberry-flavored soda include Catawissa Bottling Company, Stewart's Fountain Classics and Vess, among others. Strawberry soda can also be marketed as Red Pop. Tarragon - for example Tarhun. Socată is a traditional Romanian soft drink made from the flowers of the European elder (or elderberry) shrub, Sambucus nigra (soc in Romanian). Bludwine / Budwine – brand of cherry-flavored soft drink that was produced in the United States by the Bludwine Company and Bludwine Bottling Company. In 1921, the company changed the name of the soft drink product from Bludwine to Budwine. Production of Budwine stopped in the mid-1990s. As of 2009, the brand was in existence and run by two entrepreneurs in Georgia. Dandelion and burdock – consumed in the British Isles since the Middle Ages. It was originally a type of light mead, but over the years has evolved into the non-alcoholic soft drink commercially available today. Fentimans produces a variety of this drink. Bacon soda – soft drink beverage that has the flavor of bacon. Several U.S. companies produce bacon soda brands, including Jones Soda, Lockhart Smokehouse and Rocket Fizz. 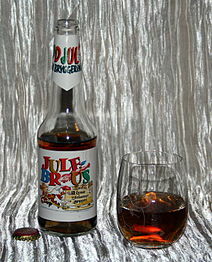 Julebrus – Norwegian soft drink, usually with a festive label on the bottle. It is brewed by most Norwegian breweries, as a Christmas drink for minors, who aren't eligible (by law) to enjoy the traditional juleøl (English: Christmas Ale), but is also very popular among adults as well. ^ The Perfect Finish: Special Desserts for Every Occasion - Bill Yosses, Melissa Clark. p. 39. ^ a b c d e f g h i Graham, William A. (1909). Biennial Report of William A. Graham, Commissioner of Agriculture. North Carolina Dept. of Agriculture. pp. 402-410. ^ "Coca Wine". Cocaine.org. Retrieved 2013-09-29. ^ Pride, William; Ferrell (29 December 2008). "Marketing". Cengage Learning. Retrieved 28 June 2016 – via Google Books. ^ "Ben Shaws Dandelion and Burdock". Retrieved 28 June 2016. ^ Sanders, Jack (1 January 2003). "The Secrets of Wildflowers: A Delightful Feast of Little-Known Facts, Folklore, and History". Globe Pequot. Retrieved 28 June 2016 – via Google Books. ^ "Definition of ginger ale". Merriam-Webster. Retrieved 2 May 2014. ^ Kijac, Maria Baez (1 January 2003). "The South American Table: The Flavor and Soul of Authentic Home Cooking from Patagonia to Rio de Janeiro, with 450 Recipes". Harvard Common Press. Retrieved 28 June 2016 – via Google Books. ^ Nocito, Anton; Hulsman, Lynn Marie (7 May 2013). "Make Your Own Soda: Syrup Recipes for All-Natural Pop, Floats, Cocktails, and More". Potter/TenSpeed/Harmony. Retrieved 28 June 2016 – via Google Books. ^ Small, Ernest (2009). Top 100 Food Plants. NRC Research Press. p. 289. ISBN 0660198584. ^ "/books?id=qw_AnLc61KAC&pg=PA28 The Quotable Drunkard: Words of Wit, Wisdom, and Philosophy From the Bottom ... - Steven Kates. p. 28. ^ Kachru, Upendra (1 January 2009). "Strategic Management: Concepts and Cases". Excel Books India. Retrieved 28 June 2016 – via Google Books. ^ The Complete Soda Making Book - Jill Houk. p. 125. ^ Carnival Undercover - Bret Witter, Lorelei Sharkey. p. 27. ^ Bowes & Church's Food Values of Portions Commonly Used - Judith Spungen. p. 5. ^ Parthasarathy, V. A.; Chempakam, Bhageerathy; Zachariah, T. John (1 January 2008). "Chemistry of Spices". CABI. Retrieved 28 June 2016 – via Google Books. ^ Houk, Jill (18 January 2014). "The Complete Soda Making Book: From Homemade Root Beer to Seltzer and Sparklers, 100 Recipes to Make Your Own Soda". "F+W Media, Inc.". Retrieved 28 June 2016 – via Google Books. ^ Report - Georgia. Dept. of Commerce and Labor. Georgia. Dept. of Commerce and Labor. 1919. p. 61. ^ Treasury Decisions Under Customs and Other Laws - United States. Dept. of the Treasury. pp. 514-515. ^ Southern Pharmaceutical Journal. February, 1915. p. 31. ^ "Budwine" New Drink Name. American Bottler, Volume 42. 1921. p. 64. ^ "History of Bludwine & Budwine". Teampins.com. Retrieved 2 May 2014. ^ Thomas, Frances Taliaferro (2009). A Portrait of Historic Athens & Clarke County. University of Georgia Press. p. 166. ISBN 0820330442. ^ Lewis-Stempel (2010), p. 153. ^ a b "'Disgusting' bacon soda turns stomach of NYers who tried it". Retrieved 28 June 2016. ^ Reitz, Scott (29 March 2012). "Taste-Testing Lockhart's New Bacon Soda". Retrieved 28 June 2016. ^ "The Cooler: Bacon Soda - Local 12 WKRC-TV Cincinnati - The Cooler". Archived from the original on 2014-05-02. ^ a b c "The Worst Four Sodas at the New Rocket Fizz Downtown".